This is a rare neurological condition which mainly affects the brain, skin and eyes. It is named after the doctors who first described it in the late 19th century. It is primarily caused by abnormal development of blood vessels during the early embryological stage. The skin, the eyes, their blood supply and the brain all have their origins from the same stem cells. Owing to the way the cells divide and specialise during this early phase of development a few deviant changes can have a significant effect on the developing individual. Sturge-Weber is a syndrome that occurs sporadically, it is not a generic condition and it is not inherited. It affects boys and girls and has been identified in all ethnic groups. Like all syndromes there is a trajectory of severity and, although approximately 60% of affected children will have some form of developmental delay and learning disability, other children are more mildly affected and, in some cases, diagnosis may be very delayed. It is probable that some individuals are never identified. The condition is characterised by the presence of a port wine skin lesion. These can be extensive and can be unilateral or bilateral. The lesions are usually on the head and face, but other areas of the body can be affected as well. The birthmarks are usually present from birth or develop and extend soon after it. Sturge-Weber syndrome is not common and is thought to affect only one child in every 50,000. The condition is also associated with seizures; about 80% of children will have epilepsy. Other physical manifestations include hemiplegia, glaucoma and migraines. The port wine birthmarks can be treated by laser therapy. Depending on the extent of the mark the treatment may take several months, or sometimes years, until the desired effect is achieved. The therapy is not pain free and some children need general anaesthesia to cope. Laser therapy is not just a cosmetic procedure: it also prevents the lesion from thickening and growing. The therapy is recommended because the lesions can bleed heavily if traumatised. The epilepsy associated with this syndrome is difficult to manage and neurosurgery may be considered. Surgery offered could include a focal resection where the area of the brain which is the cause of the epilepsy is removed or a hemispherectomy where the communications channels between the two sides of the brain are disconnected. There are only a few centres in the UK which offer this type of surgery for epilepsy. Although any surgery on delicate tissue like the brain can be risky, the prognosis is generally good. 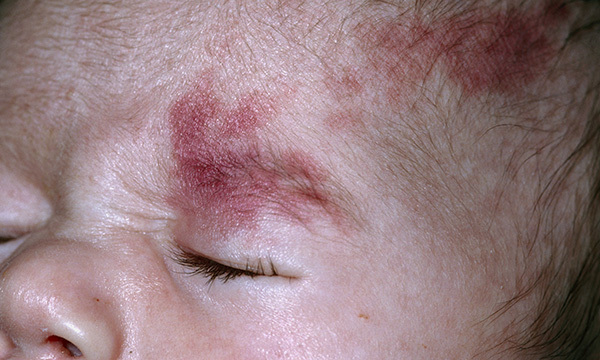 Children who have upper-lid birthmark involvement are more likely to develop glaucoma. Management depends on how severely the child is affected and includes eye drops, laser therapy or surgery. Regular outpatient appointments to monitor the condition of the eyes will be necessary. Norman and his twin sister were born at 34 weeks and admitted to special care. At birth it was noticed that Norman had a large port wine stain on the left-hand side of his face. While the twins were establishing feeding the consultant arranged some investigations and Norman was diagnosed with Sturge-Weber syndrome. The parents were devastated with the diagnosis and, once discharged, they found the reactions of their neighbours and the public difficult to deal with. The health visitor recommended that the family contact the Sturge-Weber Foundation who were able to introduce them to another family who lived in the locality, for support. At four months old Norman had his first seizure. These intensified until he was soon having anything between five to ten fits a day and some of these were prolonged. They resulted in several emergency hospital admissions. Despite several changes in Norman’s medication there was no improvement in the number of seizures he was experiencing. He was referred to a major centre for assessment to see if he could benefit from neurosurgery.